Generally, people tend to make purchases based on recommendations of their friends, relatives, or experts they trust. This way, customers know that at least someone close to them has already bought the product or the service they are currently interested in, and they rely on opinions of acquaintances more than unknown people on the web. In the XXI century, digital technologies have been taken a role of advisors by analyzing the interests of the users on the Internet – this is how a recommendation engine works. In response to a rapidly growing recommendation system development, a demand for an experienced machine learning developer increased respectively. If you haven’t developed a personalized recommendation system yet or don’t know whether it worth implementing this technology for your business, please take a detailed look at this comprehensive article that addresses recommendation system-related questions. Recommendation system, or recommender system, is a filter-based technology that helps customers to see similar products and services that they were looking for in the web before. On seller’s side, it helps to show customers more goods that they may be interested in and, thus, increase up-sales, cross-sales, and revenues of the business in total. By filtering data using different algorithms, a recommendation engine sorts the data displayed in the most relevant for the user way. Moreover, the technology catches the previous web experience of the user to show him or her more products based on analyzed interests. This personalized recommendation system not only shows potential customers more goods they are likely to buy but also forms a positive image of the seller as if the company can offer exactly what is needed. Henceforth, many companies use beneficial recommendation systems in their web appearance. Recommendation systems have been developed since the 1990s and within almost 30 years big data machine learning recommendation engines have evolved significantly into one of the most powerful client-oriented sales technologies. Even the Google search engine that was founded in 1998 used the PageRank algorithm to sort results based on customers’ needs. A lot of big companies has already caught the value of personalized recommendations and every respectable company has a data scientist for recommendation system and invests money in research departments on this powerful engine. Some companies, such as Uber, Airbnb, Amazon, Spotify, etc. has already achieved such great results in recommendation system development that they can be considered data science companies as well. No wonder, that more and more companies are becoming interested in creating a recommendation system project for their business. Let’s take a closer look at the traits of the development of a relatable recommendation system. The results of the recommendation engine sorting look like they were hand-picked for every customer personally. Thus, it is significant to develop the right model taking into account different filters to provide clients with the most interesting suggestions for meeting their needs. The recommendation system works based on a set of machine learning algorithms that use information about products and services searched and analyzes information provided by the customer himself. These algorithms are self-trained ones, they learn to find patterns in data provided and form new relationships based on learned connections. If the recommendation system analyzes user behavior of registered customers, it also can take into consideration personal information such as age, gender, country of residence, etc. Based on the gathered information, the recommendation system makes suggestions for further reviewing of products and services that the client can find attractive and useful. There are two most common techniques implemented in recommendation engines: the first one is a collaborative filtering that makes suggestions based on previous user behavior and feedback, and the second one is content-based filtering that shows recommendations based on the attributes of a current web search. The collaborative filtering is known as user-based algorithm and is more widely used than so-called product-based, or content-based algorithm because it shows more accurate results. User-User collaborative filtering: searches for customers with similar interests and preferences, makes suggestions for one person based on what another similar person likes. This algorithm is effective but it is time- and resource-consuming, so it is hard to implement it on practice. Item-Item collaborative filtering: works the same way, but finds similar products instead of similar users. If a user was interested in a product or service with some attributes, the algorithm will suggest another product or service with similar or related characteristics. It takes fewer resources to operate than user-user approach. Other simpler approaches such as a market basket analysis usually do not show high conversion rates and significant increases in sales, so the main algorithms used are the two mentioned above. Also, there is a hybrid approach that combines both collaborative and content-based filtering to provide customers with the most relevant recommendations. A good example of hybrid approach implementation is Netflix that analyzes both watching and searching results of users with similar interests (collaborative filtering) and offers films with similar characteristics to the one that was highly rated (content-based filtering). This way, the company became well-known for its smart and accurate movie recommendations. Creating a recommendation system requires a solid analysis of user behaviors on the web, understanding the pros and cons of the product or service offered, and a connection between these two. The specialists who understand how the recommendation engine operates and how to build a recommendation engine are in a high demand nowadays, because thanks to the predictions of recommendation system algorithms customers can get the maximum relevant information about your business. It is the recommendation system machine learning developer who can help you with developing a useful recommendation system. Building a recommendation engine with Python, Java, or other programming language depending on your needs and initial requirements, an expert can develop the right algorithm to benefit both you and your customers. For example, a recommendation system Python developer can apply different technologies such as Django, Pandas, SciPy, and Scikit-learn to build a powerful recommendation engine, thus, Python is popular as a programming language for this purpose. Java recommendation engine developers prefer applying collaborative filtering because it is easier to implement using Java’s ranging Slope One algorithm. Also, a Scala recommendation model with use of Spark and collaborative filtering algorithm allows filtering recommendations by several specific values that makes the model useful one. Moreover, by adding AWS services (EC2, S3, SES, SQS) you can improve the workflow of your recommendation engine and provide your visitors with the most useful results. Nowadays, there are different options available for recommendation system development and if all above sounds too complicated, all you need to do is to find an experienced recommendation system developer that will help you with understanding the basics of the recommendation engine, developing one for your business needs, and successful using the system further. It is important to highlight that it is the personalized recommendation systems that work for customers needs best. General, random suggestions will not interest visitors as much as those offered based on their needs, interests, and searches. And the personalized system works as a personal advisor by identifying every user’s preferences through data and behavior given on the web and concluding it by relevant recommendations. Getting the relevant recommendations, users waste less time on search and find good deals shortly. Past user behavior helps to show targeted content only. 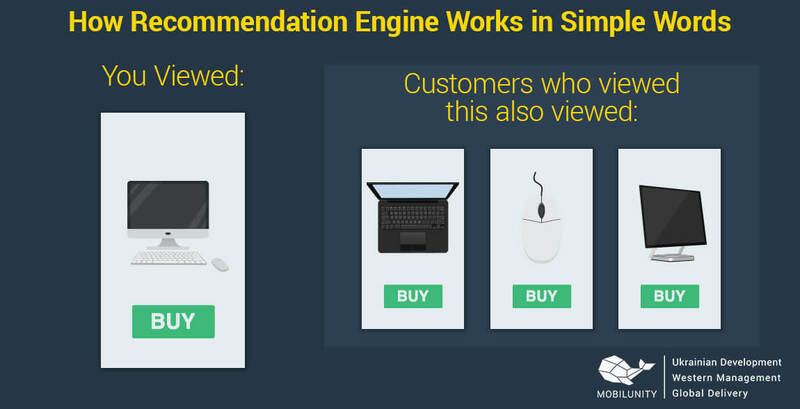 Users make decisions on purchasing goods even quicker if they have recommendation around. A current purchase contributes to previous statistics of the user, and with time the recommendation system shows even more accurate results. Some websites may suggest products and services wrongly based on too little information gathered. Occasional web search can have a great impact on the total statistics and the user can start seeing unnecessary content as well. Users who click and follow the recommendations are the best customers because they visit more pages and, thus, help the recommendation engine to learn more about their interests and needs. Moreover, usually, they purchase a higher number of products and services because of the recommendation reviewed and they will more likely come back. A typical content recommendation engine for B2B needs works with data in five stages mentioned below namely collecting, storing, analyzing, filtering, and suggesting. The data collected can be either explicit or implicit. Explicit data relates to the information inputted by the customer, for example, rating or comment. Implicit data consists of a history of search and visits, clicks, cart adds, etc. This data set is saved each time the user visits the website and it is easy to collect the behavior data because of keeping a log of user experience on the website and it doesn’t require any additional actions from users. The more data the algorithms can access, the better the recommendations it will be able to produce. Thus, any information related to the user and provided by the user can work for the recommendation engine to generate the most relevant recommendations. Of course, the best recommendation is the quickest recommendation possible. To provide customers with immediate suggestions, you need to consider one of the following types of analytical approaches. A real-time system can process data after its creation, while the batch system can work with information fast, but periodically only. The near-real-time system is a winning combination that allows to gather data quickly and make offers in few seconds while the user checks content on the web page he visited. Filtering the gathered data is the next important step to provide customers with relevant suggestions only. As we mentioned before, you can use collaborating, content-based, on hybrid filtering based on your needs and preferences. Finally, the recommendation based on the data obtained, analyzed, and processed are generated. It can be a real-time offer or a follow-up email sent after user experience. By taking into consideration these five steps you can get the maximum of a content recommendation engine B2B-related needs. Also, by continuing analyzing working results of your recommendation system, you can understand what filters should be changed or improved to improve user experience and recommendations as well. Optimizing the suggestions of the recommendation engine, you can manage a win-win situation where your customers get relevant information and you get more purchases respectively. The so-called ‘recommendation as a service’ system, or SaaS recommendation system, represents a platform that gained popularity in last years by applying general recommendation mechanism to business needs. No wonder that the whole idea of the recommendation engine is a great base of SaaS-based solutions because of their valuable suggestions and near-real-time data processing. This type of SaaS system are easy to install and manage and many of them are available as additional features for CMS and eCommerce engines. Consequently, they provide the easiest suggestions: what is popular, what is almost sold, new arrivals, etc. They can be helpful for businesses with 100-150 similar items and moderate customer base, specific niche of products and services, informal leads. More complex businesses usually require more personalized suggestions based on collaborative or content-based filtering methods. These systems usually provide more accurate suggestions and can be integrated with almost any web-based platform with items, users, and events presented. Self-service SaaS systems are developed individually for each business and, thus, shows better results than just a plugin or an add-on. Now you know the basics of the recommendation system using and the advantages it can bring to your business. By understanding your needs and helping customers make a purchase with smart suggestions provided by the machine learning mechanism, you can increase your revenue with up-selling, cross-selling, and wholesales of the products and services you provide. It is worth implementing the recommendation system, isn’t it? Is It Possible to Find a Great Recommendation System Developer Shortly? With implementing a smart recommendation system for your business, you can understand wants and needs of your customers and set up a technology that allows your customers seeing the most relevant options among the products and services you provide. No wonder that the recommendation system can work great for your sales results and good reputation, thus, it is vital to use the benefits of this recommendation machine learning algorithm. Fortunately, there are experts that can help you with developing the recommendation system based on your requirements. In Mobilunity, we have a team of experienced professionals who set up a number of successfully working recommendation systems. We will be happy to assist you with building a helpful recommendation system, so you could start reaping the benefits of using a recommendation engine for your business shortly and enjoy your sales revenue. If you are looking for reliable and experienced developers to create a recommendation engine for your business needs, Mobilunity team is here to help you!